American Curl cats have a very unique trait: they have curled back ears. The first time I saw one, I thought that somebody had playfully turn the cat’s ears inside out. So, how did these kitties got their curled ears? A relatively new breed, the American curl cat breed was created in California during the early 1980s. The origins of this interesting breed can be traced back to the streets - literally. Indeed, modern American Curls are descendants of a stray cat named Shulamith. The fortunate kitty was rescued by a couple of cat fanciers: Joe and Grace Ruga. Quite surprisingly, this kitty had curved ears. She later had a litter of kittens, and soon they all developed curled back ears. The Rugas then decided to develop a new breed from these unique "strays". 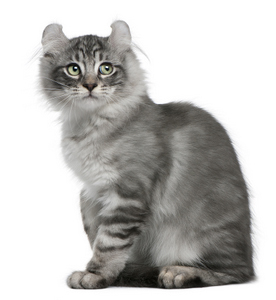 Interestingly, the unique curved back ears of the American Curl cat are the result of a natural mutation. So even though they look like designer cats, these kitties are in fact quite natural. Are Scottish Folds (another cat breed with unique-looking ears) and American Curls related? No. 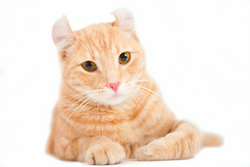 The American Curl and Scottish Fold breeds are recognized as two separate breeds. The first cat organization to recognize the American Curl as a new breed was The International Cat Association (TICA), which accepted this breed into its registry in 1986. The Cat Fanciers Association (CFA), the largest cat registry, recognized the American Curl as a new breed in the early 1990s. American Curl cats' best known characteristic is their curved ears. However, they are not born with curled ears. In fact, American Curl kittens are born with normal-looking ears. The ears start to curl within a week. An interesting trait of the American-Curl is that there are different curl gradations: some cats have near-straight ears, others can have slightly curved ears, while others have severely curled back ears. By the way, owners of American Curls should periodically check their ears for wax buildup and to make sure they are clean and healthy. Curls weigh from 7 to 10 lbs on average. These kitties are mostly medium-sized and come in practically every color and pattern. American Curls also come in both short hair and long hair versions. However, you will find more American Curls with long hair. 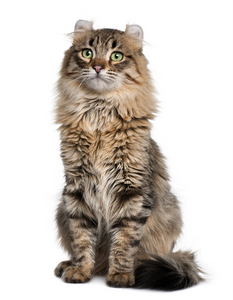 Luckily, their coats are soft and silky and do not require frequent grooming. Because they come with a little undercoat, American Curls shed very little. Another well-known trait of this unique breed is that they have large and very expressive eyes. Breeders out cross American Curls with cats that have straight ears. This is done in a effort to produce a genetically diverse gene pool. Because of this extra care in their breeding, Curls are very healthy and have few genetic defects. American Curls make wonderful pets. They definitively love attention even though they are not as vocal as other cats. Curls do express themselves by producing noises, including trilling and cooing. American Curls are also social and affectionate, and get along with other pets. They enjoy children and are very active as well. You can’t ask for anything more!